Hello everyone! I am so happy to tell you I am Carnival Queen for 2018 with my two princesses, Megan and Sophie. I go to Clacton Coastal Academy and I am in Year 10, and my wonderful princesses are both in Year 7. If I am not at school you will find me at dance. My dance group is called Alliance and we won the British Winterguard Championships last year. I am also staff for the younger children. Anyway, that's enough about me! Now I want to say a big well done to my Carnival Princesses - these girls are so lovely and I cannot wait to meet them again soon! Last night was amazing, it was selection night! Despite being a little nervous I was so excited for the Queens to go up. Afterwards I was having so much fun I think I didn't sit down once until the 2018 Carnival Court was announced! When I was announced as Clacton Carnival Queen for 2018 I was so happy for myself and my new princesses! I want to say a big thank you to the judges and everyone that helped as well - I know me, Sophie and Megan all enjoyed the event so much. I woke up so excited still trying to take it all in from last night, but today was our photoshoot for the newspaper. I couldn't wait to meet my princesses again - even though it was starting to rain we were all still so happy. We went into the Boardwalk to discuss the carnivals and have a chat about the dress fittings! I cannot wait for our first dress fitting in the Easter holidays, when I get to meet up with my princesses and the Carnival team again! After having a talk inside and swapping phone numbers the rain had come to an end so we went outside to take our photos! We walked to the pretty flower gardens and took some pictures there with our crowns and tiaras on for the second time ever. The pictures were so nice and I can't wait to see them in the newspaper soon. That's it for now! Today me and my princesses had our first dress fitting. When I arrived at Lacey's Bridal Boutique at 9:30, I saw Megan and Sophie again and I was so excited to get started so we went upstairs to start discussing the dress style and colours for this year. We were excited to hear that our dresses are going to be a different style this year compared to last year's, as you will see in June! This morning I was picked up by Carol for the Carnival colouring competition launch at Rascals. I was excited to see my princesses again at our first event together. Unfortunately the turn out was poor but despite this we still had a great time meeting the Rascals characters and getting to know each other. Thank you to Rascals, who looked after us so well and gave us all a fabulous morning. I had lots of fun with my new Carnival family. Today me and my two princesses, Megan and Sophie, had another dress fitting. I arrived at Lacey's Bridal Boutique at 4pm ready to try on my dress. They had done a lovely job and my dress now fits perfectly! After having a walk around, Jenine and Debbie arrived - we received the most beautiful flowers and bags matching our dresses containing a rain poncho and a pen. Another gift we got today was our Carnival t-shirts and jumpers - I can't wait to wear these to all the Carnival events that you will see us at. Shortly after this, Megan arrived to try on her dress, however it still needed adjusting slightly before we can wear them at our first Carnival. Unfortunately my other princess, Sophie, couldn't make it today. In nine days we will have our first carnival together, wearing our dresses out for the first time - I can't wait for you all to see us! Today was Brightlingsea Carnival - our first event! Carol picked us all up at 10 o'clock, ready to travel to Brightlingsea together. When we arrived at the field, we all saw our amazing float (which Debbie and Jenine have been designing for weeks, and they did a really good job!) 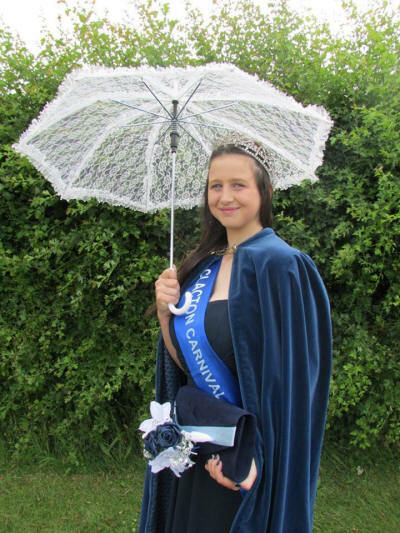 The float is called the Sapphire Queen, named after the paddle steamer boats that used to visit Clacton, and also because, being the 65th anniversary of Clacton Carnival Association, I am the Clacton Carnival Sapphire Queen. The float is decorated around this theme, incorporating the colours of our amazing dresses. After fixing our dresses and crowns, myself and my Princesses went to meet the other Courts and invite them to our Carnival in August, and then we got to sit down on our float before the judges came round. When the judges got to us, we spoke to them about our float and even asked the Mayor of Brightlingsea to wear his chain! Shortly afterwards, the judges came back with a rosette for me for coming third place for Queen of Queens, a second place for my two wonderful Princesses, and second place for our float. After this, we got settled on our new float - however Debbie's car would not start! The lovely Witham Carnival Court invited us to join them on their float but when we got about halfway round, we decided that it was getting too hot as there were so many people on the float, so we got off and walked. Walking the carnival meant that we got to go up to the spectators and collect more for charities. I really enjoyed walking, however I look forward for being on our float next week! After the procession all the Courts took a beautiful picture together, then went in to our first Queens' Tea! It was very nice - we had a buffet and were joined by all the the other Carnival Courts. I had a really good day - thank you to everyone that came to see us! Myself and my Princesses can't wait to meet more people and raise more money together at Mersea Carnival. The night before Mersea Carnival, Sophie invited us all to stay at her uncle and auntie's caravan for a girly sleepover. The sleepover was amazing and Sophie's aunt, who is a hairdresser, put our hair in lots of colourful curlers. We woke up around 6:20am and before we knew it, we were at the hairdressers at 6:30am! Lisa (Sophie's auntie) did our hair ready for the carnival and it looked amazing - we had a quiff at the front with our hair made into a flower at the back with lots of curls as I'm sure many of you saw! Looking out of the window I saw that Carol and Hannah had arrived at the salon a bit early, but when our hair was finished and looking beautiful, we had a photo taken outside and jumped in Carol's car, ready to go all together to Mersea Carnival. Once we arrived at the carnival we said hello to Mersea Island's Court and had a walk around to hand out the last of the invitations for our carnival before having some photos taken. The pictures that Jenine took were so nice and I can't wait to see them all later! Next, we all got on the float ready to go as judging was being done along the parade route. Our float started! Before we knew it, we were dancing on the float to the Macarena and Saturday Night. When we completed the carnival, we were invited to an amazing Queens' tea. We all sat on blankets on the floor for a Queens' picnic of fish and chips, with sweets afterwards. Now... the bit we had all been waiting for, the judging! We came joint third place! After this, we got to go and have a look around at all the stalls. Megan decided to buy a beautiful bow from a lady who was also from Clacton and cheered us on massively so we took a photo in front of all her bows. Mersea Carnival was amazing - we had really good fun and we can't wait to welcome Mersea Court to Clacton Carnival. Next week we are all excited to attend Great Bentley Carnival! I woke up so excited - it was Great Bentley Carnival! After getting ready and changed into my amazing dress, my mum took me to Airwaves Hair & Beauty at 8:15. Sophie's lovely auntie, Lisa, did our hair for the day - my two princesses had beautiful four-strand Dutch braids and I had a pretty bun. After we all had our hair done, we took a photo outside the salon and then all got in Carol's car to get to Great Bentley. When we arrived at the carnival we saw our wonderful float again, which Debbie and Jenine had been decorating to adapt it to the carnival theme (International Celebrations and Holidays). They added strings of beads and some masks to celebrate Mardi Gras, which is held in Louisiana. We had more photos taken together which I can't wait to see later, then after this we went back to our float ready for judging. After discussing the theme of our float to the judges and exclaiming to them our favourite holidays, we shortly found out that we came second for Visiting Queen's Court! We also want to say well done to Walton Carnival Court for coming first in this category. Great Bentley Carnival was amazing - there were so many people there to support us and the atmosphere was amazing. After the procession, we all went up onto the stage for the awards and found out Witham's Carnival Queen received the Queen of Queens trophy. Unfortunately there was no Queen's Tea this time so we got barbecue tickets instead. After saying goodbye to all the other Carnival Courts we headed home. We had a really good day at Great Bentley and everyone looked so lovely. We were also very lucky to have lovely weather! I can't wait for our next event. Today was something different - we'd been invited to Burrsville Infants' school fete. Being invited to a fete was something a bit special as over the past few years Carnival Courts haven't been invited to any! When we arrived at the fete, we were greeted by some lovely people and then invited into the school library out of the hot weather while everyone set up. At 11 o'clock the fete opened and we had a walk around. We all had a go on the hook a duck game - we had 30 seconds to see who could hook the most ducks - I got none, Megan got two and Sophie got three, winning the game! After this, we walked over to some beautiful horses and had our picture taken with them. The people running Burrsville fete were so lovely and made us feel very welcome! After meeting a few people - and Megan buying more duck teddies! - we decided to also buy some raffle tickets and head home after a busy morning. Thank you so much to everyone at Burrsville - we had a really good time! Today we were invited to give out certificates for a fabulous group of people that had completed a Walton-to-Clacton walk supporting a children's charity named Magic Moments. The walk was started by Walton's Carnival Queen at Walton Pier and ended by myself and my two Princesses on the beach by Clacton Pier. We would like to say well done to all of you - especially Bobbie and Ian, who dressed up as Mickey and Minnie Mouse in this heat! You all did an amazing job today. Approaching Rascals for the results of the colouring competition we saw many people had already arrived! First, we put our crowns on once again and stood for some photos in front of the winning competition entries. After this was the bit everyone had been waiting for - the awards! There were so many winners and I would like to say well done to every one of you. The pictures you did were fantastic and you all deserved your prizes! After everyone had collected their prizes we took some more photos with all the children and then headed home - just in time for the football match for Princess Megan! Today, Sophie's Auntie Lisa had offered to do our hair again, so our day started by visiting Airwaves Hair & Beauty. Our hair looked lovely - myself and my princesses are so grateful for Lisa's kind offer each week! After all our hairdos were complete, Hannah picked us up at 9:45 and took us to Witham. We had a long chat about McDonalds in the car, then we finally arrived - and we were the first court there other than Witham's! After eating some of our lunch, we decided to introduce ourselves to Witham's new Carnival Court. The new court were lovely! We also spoke to Witham's retiring court for a while, and then we noticed that a lot more courts had started to arrive so we went to say hello to them too. After speaking to all of the courts, it was time for judging. First we spoke to the Mayor of Witham and I got to wear his chain of office! Then afterwards, the princesses' judge came round and spoke to Megan and Sophie - and I have to say, they did a really good job. We were awarded second place for Visiting Queen! Next we took some photos on our float and got ready to start the carnival. There were so many people that came out to support us today and we thank them all! When the procession had come to an end, we all took our seats in the arena for the opening of the carnival and the awards. Witham's new Queen, Charli, said a lovely speech about opening the fete and then the awards for majorettes and bands were given out before we went and had Queens' tea. Arriving at Queens' tea we say that we all had beautiful placemats with our photos on! Next we were able to eat - Witham's Queens' tea was amazing, we all loved it so much! I want to say a big thank you to Witham for inviting us along to your carnival - we had a lovely day! Around 9:45, we were picked up by Carol to go to Morrisons for a morning of raffle ticket sales. When myself and my Princesses arrived, we met Debbie (the lady who organised the event). We had a stall outside, at which we sold raffle tickets for the Grand Draw at Clacton Carnival. Me and my Princesses had a walk around to try and sell as many raffle tickets as possible. The morning started off slowly, however we soon started selling lots of raffle tickets and altogether raised £223, which beat last year's record! We had a good morning and also loved meeting so many of you! At 12 o'clock, Hannah came and picked us up from Morrisons for our second event of the day, which was Holland fete! Unfortunately Princess Sophie was only able to come to the raffle ticket sales today and not the fete due to going on holiday, but Megan and I had a great time. As soon as we arrived, we were made to feel very welcome and I was given a lovely burger! After eating, we had a walk around the stalls and saw all the wonderful things people were selling - then after this, we went inside the hall and met Paul Barber (from Only Fools and Horses)! Megan was so excited to meet him and could not stop smiling. We took some photos with him and heard that he was heading to Wales tomorrow to start filming for the TV show, Casualty! Next, Megan and I had some photos taken in front of (and in) a modern-day police car and an old one. One of the ladies at the fete then came outside to meet us and we were invited to draw the raffle tickets alongside Paul. Well done to all the winners, the prizes looked amazing! We had a really good afternoon at the fete and want to thank every for inviting us. Overall, my princesses and I had an amazing day and we can't believe that our next event is Clacton Carnival! I am so excited and can't wait to see all the community together. It's here!! The day we have been waiting for - Clacton Carnival!! Earlier today, my princesses and I went to Airwaves Hair & Beauty and had our hair done - and after we were all done it looked amazing! A little while later, it was time to get ready and into our dresses before Carol picked us up for our very own carnival! When we arrived we said hello to all the judges and met a visiting princess from Newport Pagnell - she was on holiday and wanted to join us! A little while after, our float arrived and we were asked to sign a card for Dave's (our driver for the day) birthday. Happy birthday Dave! When we handed him the card, he was so happy and I'm glad we lightened his mood. Next, we went to welcome all the entries for the carnival - thank you so much to everyone who entered! Soon after this, we were called over to take part in some judging for the new category for this year, the walking entries. This group encourages people to take part in the carnival, walking without a float or car, which keeps costs low and means you get to enjoy walking along with the carnival and raising money with family and friends. This year, we only had one person take part in this category so she came first, but we hope to have many more join us next year! Our last job before the carnival began was to hand out all the other awards to the winners in each group. Thank you all for coming and well done! The time had come to get on our float and lead the procession through our town!! The carnival was amazing - so many people came and supported us and I thank you all so much! Lastly was our Queens' Tea. Walking into the hall at the end of the carnival, I could see the beautifully decorated tables and could not wait to go and have a look. The Inner Wheel ladies had done an amazing job! Soon afterwards, we had to stand near the door and welcome all our lovely visiting Courts for the day. Once everyone was inside, we received some pretty badges from Invicta Kent, and then came my last job for the day - to deliver my speech. Despite being a bit nervous before, I loved giving a speech and even nearly made Carol and Kimberley cry! When we finally got to eat, it was so nice - the food was wonderful, even the fruit and cakes at the end. But the final part of the day was saying goodbye to everyone and wishing them a safe journey home. Clacton Carnival was amazing and I enjoyed every second of it! Well done to Kimberley Primmer for organising such a great event! Today was our Carnival car boot sale and the brand new wrestling event! We were collected from our homes by Carol and arrived at Alton Park School to start the car boot sale. There were so many stalls there today and soon after, many people too. After helping Megan's nan set up the carnival stall, we decided to sell some raffle tickets. We made lots of money and sold many tickets before going home for lunch. When we came back to the field in the afternoon we saw the wrestling ring was all set up, so we went round to the people there and sold some more raffle tickets while Princess Sophie also handed out some leaflets. The first match started so myself and Princess Megan sat down to watch. After a little while, the wrestling got really good and everyone began to get really involved, and we even got to have photos taken in the ring! We had a really good evening - thank you! Hello everyone today is Great Dunmow carnival! At 9 Mean came round my house to have her hair done. After having our hair done Hanna came and picked us up and then we went to get Sophie. Jenine told us that their theme is red white and blue so we tried our hardest to use all the colours. We had red ribbon and glitter in our hair and our dresses and the float were blue anyway. It took us about an hour to travel to great Dunmow. However when we were there we went over to our float that Jenine and Debbie had decorated to the theme really well, there was red white and blue beads all over the front and the British flag bunting across the back. After having something to eat the judges arrived. After a very quick chat with them they moved on to judge the court behind us. Once the carnival started we began waving and smiling to everyone, today there was many people who supported us. Some of the comments were “we love Clacton” and “you look lovely”. These comments made us proud of our town and really thankful to all of the carnival committee for giving us our beautiful dresses and crowns and especially the float. Another thing I really liked was during the procession we were introduced very well and they told everyone a little bit about us. Also towards the end there was a man who asked us questions for the radio. Great Dunmow procession was really unique and interesting. Arriving back at the field we did our last few waves and got ready to get off our float. We were lead by this lovely lady to where the other courts were standing. Standing waiting for queens tea we spoke to Walton court who were so nice to us. Next we walked across a section of the field and were introduced again. This is also when we found out Witham court won. Well done Witham. Going into to queens tea we saw all the lovely food and found our tables. After eating we all did our speeches and said goodbye to each other before leaving. Thank you so much for having us Great Dunmow we have an amazing day. Today is Burnham-on-Crouch Carnival. This Carnival is our first night carnival of the year, and our last wearing our beautiful dresses from Lacey's Bridal Boutique. We were picked up from our homes at 2 o'clock by Hannah and Kimberley to travel to Burnham, and after singing many Disney songs in the car, we finally arrived. Unfortunately we didn't have our float for this carnival due to Jenine and Debbie having visitors, but we still wanted to come and take part to support our friends at Burnham Carnival. We decided to sit by the sea while I did my princesses' hair and helped them to put their tiaras on, and then it was time for Queens' Tea. We were so excited to go into tea because we learned that judging for the Queen, Princess and Court competitions took place here. Walking into the yacht club we were greeted by the new Burnham Court who looked amazing, and then we found our table, which we shared with Great Dunmow - we had an amazing view of the sea from the window! It was lovely to be able to visit another coastal town. After talking about my plans for after my year as Queen was done, we saw all the food being brought out but before we could eat, Burnham's new Queen made a speech thanking everyone. Once we'd eaten, we were called out for a photoshoot on the balcony outside, overlooking the quay. The photographer was really good and I'm so excited to see the photos she took of our Court! We went back inside the club and then it was time for judging. The judges came over to us, and we told them how excited we were, just in case they hadn't seen already! Then it was time for the awards - I came second place in the Queen of Queens competition to Burnham... well, so we thought! Once we took some photos with Burnham's Court, we headed back to Hannah's car so we could put some more layers on as it was getting cold very quickly. We also put the lovely flowers Debbie had made for us, on our wrists. We were so excited for the procession to start and went to collect our buckets. We decided to pick up some big ones as we planned on collecting lots of mony to help Burnham Carnival support their chosen charities. We had a walk around everyone's floats and when we got back I was happy to receive the first place prize for Queen of Queens, so we exchanged prizes, before playing a few games with Hannah and Kimberley. There were a number of different Courts who were so kind to offer us a lift on their floats for the upcoming procession but we walked with Mersea Carnival Court, who even gave us glow bands to wear! Burnham Carnival was amazing and both me and my princesses enjoyed the carnival so much. We collected so much money! After the carnival finished we headed for McDonalds before making our way home. In two weeks time we are going to Witham Presentation Evening and dance, which we are so excited for as it's our first dance this year!